(Last previous visit on March 11, 1916). Captain (Major?) George Elliott, Royal Irish Regiment is still the ranking British Officer. There are now 686 officer prisoners in this camp (with accommodation for about 900) of whom 26 are British, 18 having been transferred from Halle a short time ago. In this camp there are now 13 British soldiers serving as officers’ servants. The new huts with good sized rooms, accommodating two captains or officers of higher rank, are now occupied. The grounds have been enlarged and there is mail more space for exercise. The officers are preparing to hold “Olympic Games”. The only complaint made was in, regard to the rate of on remittances from England, which has been fixed officially by the German authorities. Lieutenant C..H.J. Chichester-Constable who recently made another attempt to escape is still imprisoned in the Polizei-Präsidium. Lieutenant J.L. Hardy Connaught Rangers who escape from Halle a few weeks ago but was retaken and transferred to Magdeburg, is also a prisoner in the Polizei-Präsidium. Both officers are in excellent health. Lieutenant C.F.L. Templer has been transferred to the Festungsgefängnis at Wesel. Captain W. Allistone was transferred from Magdeburg to an institution in Halle in March (British Foreign Office’s Note No 72691/16/P of April 19th) where he is under observation with a view to ascertain his exact mental condition. The Russian officer prisoners have been transferred from the Officer prisoners camp (Scharnhorst-Wagenhaus) where the total number of prisoners is now considerably less than it was during the winter. The number of British officer prisoners remains about as heretofore. 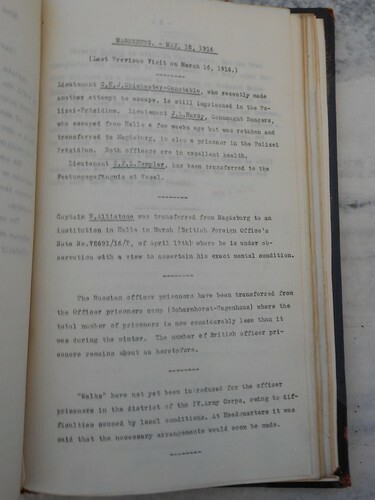 “Walk” have not yet been introduced for the officer prisoners in the district of the IV Army Corps owing to difficulties caused by local conditions. At Headquarters it was said that the necessary arrangements would soon be made. Private H. Ward is still in the lazaret, but has been designated for transfer to Switzerland. The only other British prisoner in a lazaret in Magdeburg is Sergeant Major Ingham, Scots Guards, who was transferred from Stendal soon after that camp had been visited by Messrs. Dresel and Osborne, on March 2nd (report sent to London, on March 7th). Ingham’s wound has now healed, although his sight is impaired, and he is soon to be sent back to Stendal.